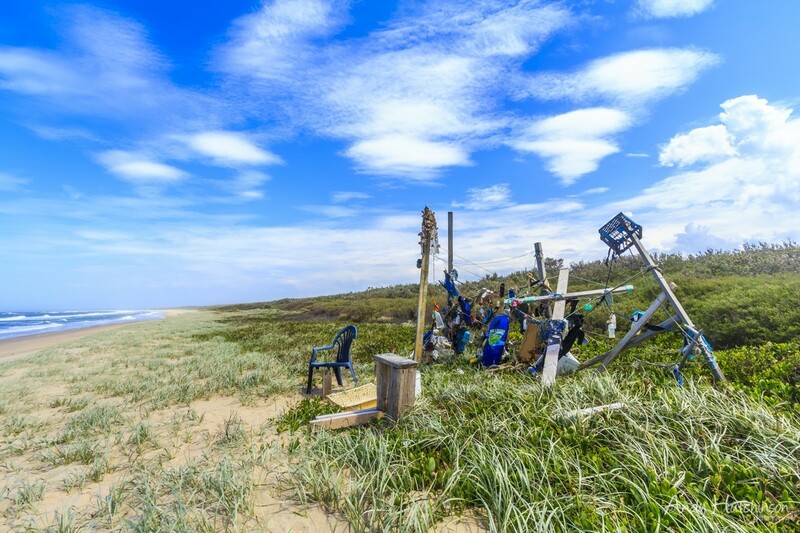 During Friday and Saturday an intense storm formed off the east coast of Australia and started tracking south from Queensland, through the border to New South Wales and on further down the coast. Nothing unusual about that – east coast lows are a regular occurrence in this part of the world. However this storm was destined to produce more than just heavy rain, big ocean swells and lots of precipitation. On Sunday, at 3:18am I woke up with a start. There was a loud thumping noise coming through the ceiling. My wife woke up too and we both looked at each wondering what the hell was going on. I went to turn my bedside light on but there was no power, so I picked up my iPad, turned it on and used the screen to light my way upstairs. I quickly found the source of the noises. My son had been woken up by loud noises outside the house and he found himself in near total darkness with no light source. Being very afraid of the dark he’d gone to the only lightsource he could find (my laptop screen) and jumped up and down on the floor to try and wake us up, too afraid to brave the stairs. My wife calmed him down, got him a torch and we all went back to bed, assuming that the storm had taken down a power-line, not an unusual occurence. We didn’t really consider what could have awoken our son (a very deep sleeper) at that time of the morning. In the morning I headed down to the beach to see if the east coast low had spun up some monster waves. It hadn’t, just a very messy swell. 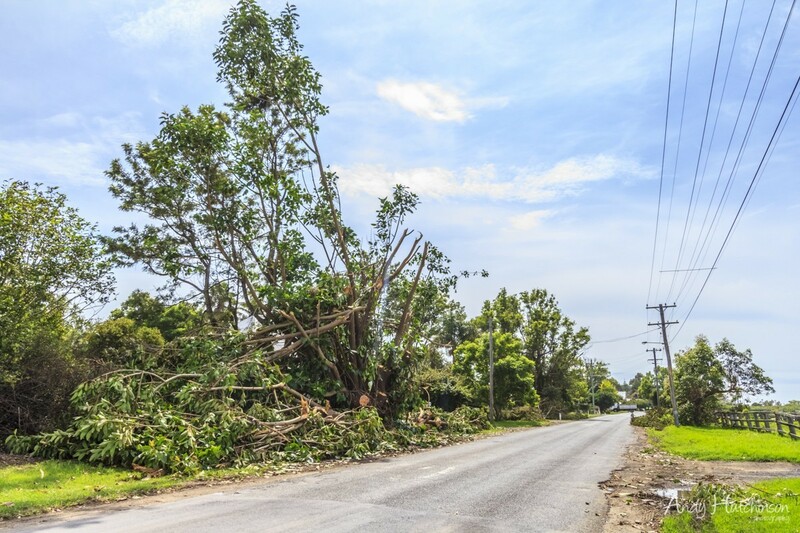 However friends told me that there were lots of trees down everywhere – so many in fact that the town was effectively blocked off until the S.E.S. arrived with their chainsaws and cleared the roads. 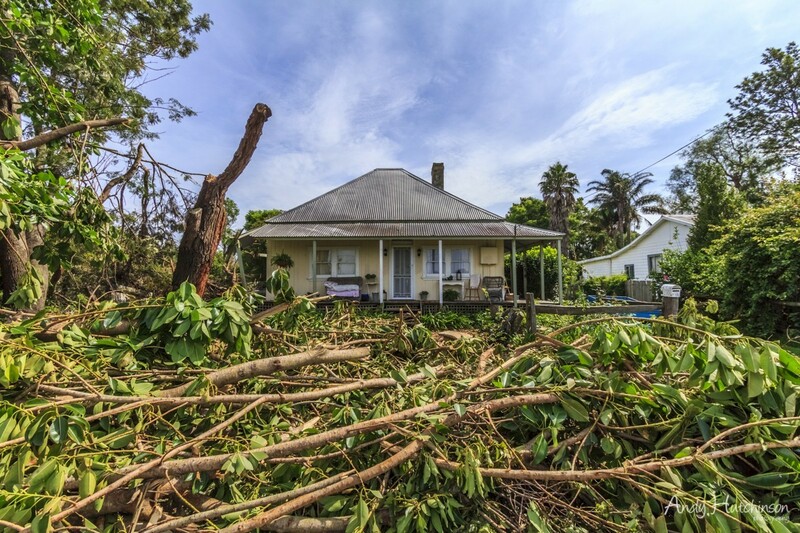 On the news there were reports of strong winds taking the roofs off houses in Kiama. They also referred to ‘mini-tornados’ elsewhere including one near our village of Shoalhaven Heads. 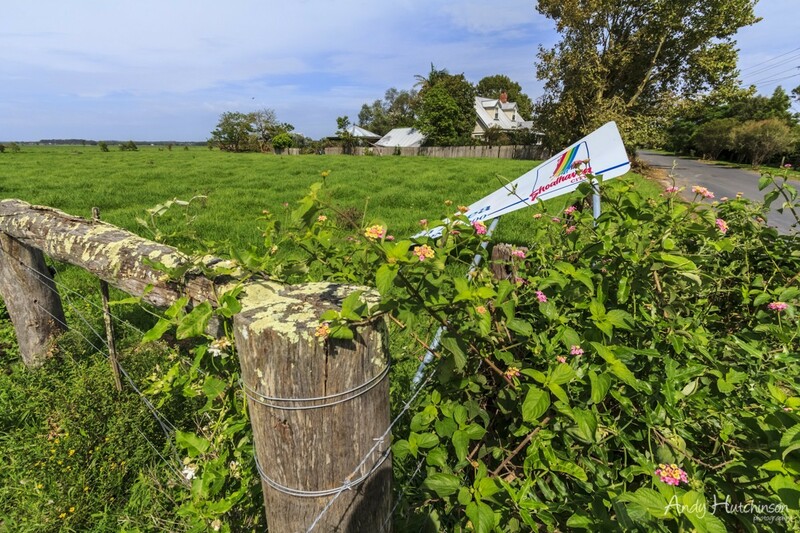 After some exploration everyone quickly realised that there was nothing ‘mini’ about the wind that had blown through this part of south coast New South Wales. 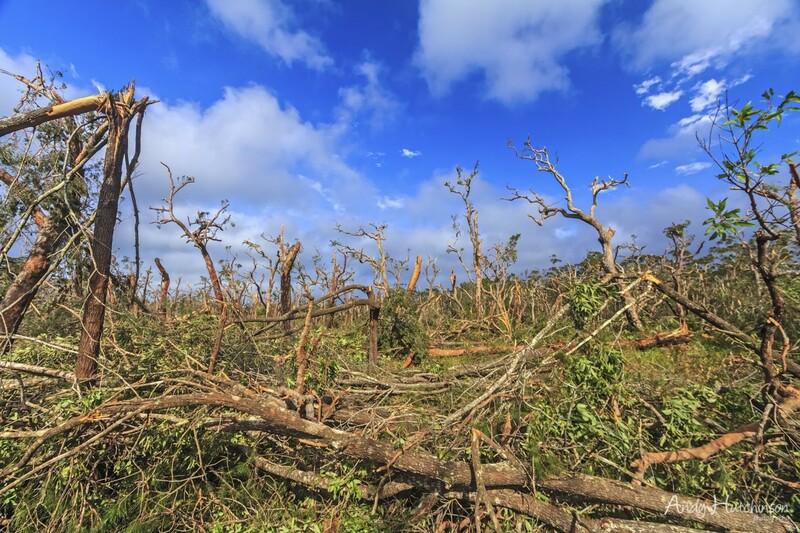 Trees were down everywhere, houses had lost roofs, farm buildings had been destroyed and livestock had been killed. Locals with a helicopter took to the air and photographed the destruction – they said that there was a clear line showing the wind’s track, in from the coast and that it linked all the affected spots. 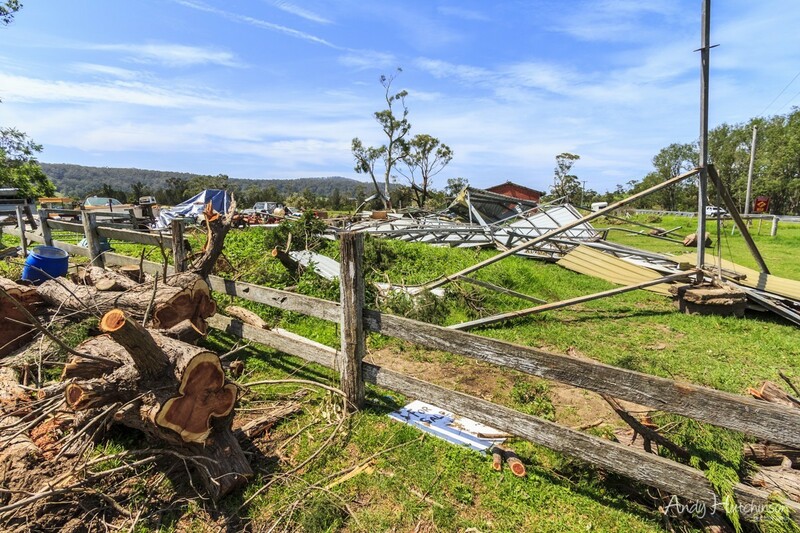 Later, as the full extent of the damage became apparent the Bureau of Meteorology confirmed that it was indeed a tornado that had visited us, an F2 tornado at that – more powerful than its cousin that blew through Kiama. The tornado carved a 300m wide swathe through Seven Mile Beach National park that made it look like a small nuclear bomb had gone off. 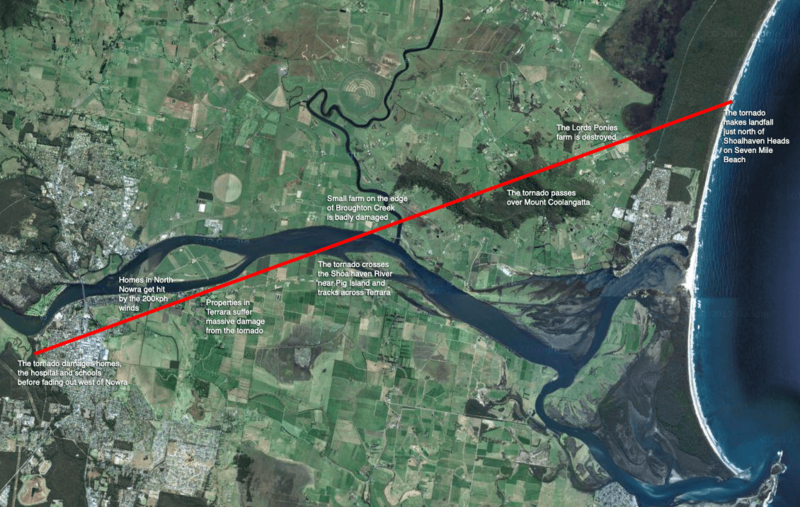 It crossed the Gerroa Road and started heading inland. This spot has now turned into something of a local tourist attraction, with cars lining the road at most times of the day and tourists taking snaps on their smartphones. Lords Ponies farm felt the full force of the tornado. The house was damaged and the farm buildings were almost totally destroyed. 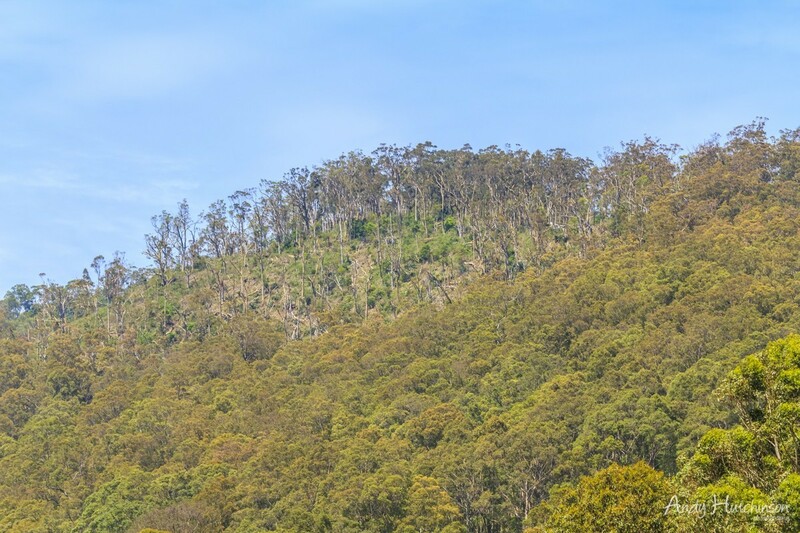 Having obliterated the Lords Ponies farm the tornado carried on over the top of Mount Coolangatta, flattening trees on the northern edge of the hill. 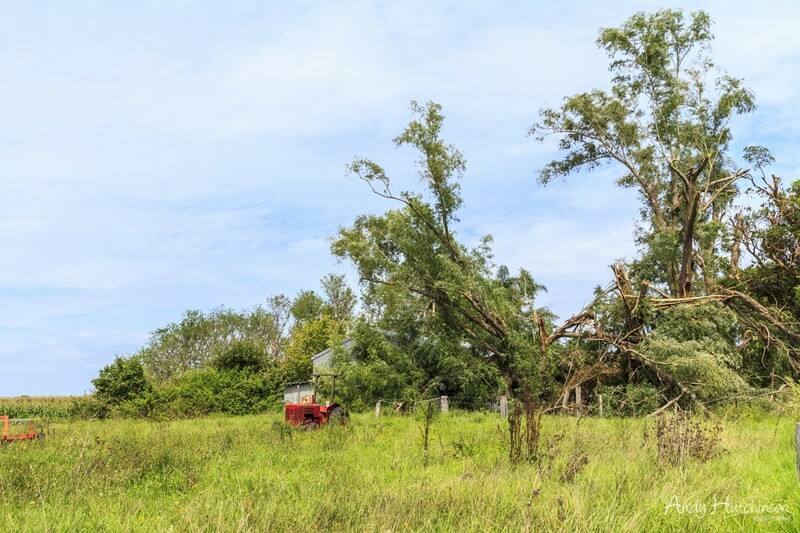 Moving away from Mount Coolangatta the tornado continued to fling farm machinery in all directions before wiping out trees on the edge of Back Forest Road which runs alongside Broughton Creek. This small farm suffered incredible damage to outbuildings and livestock. The landowner told me that a much loved horse was badly hurt in the storm and had to be put to sleep, but not before a stream of passing tourists had whipped out their iPads and stopped to take photos of the horse with half its face hanging off. Shame on them. 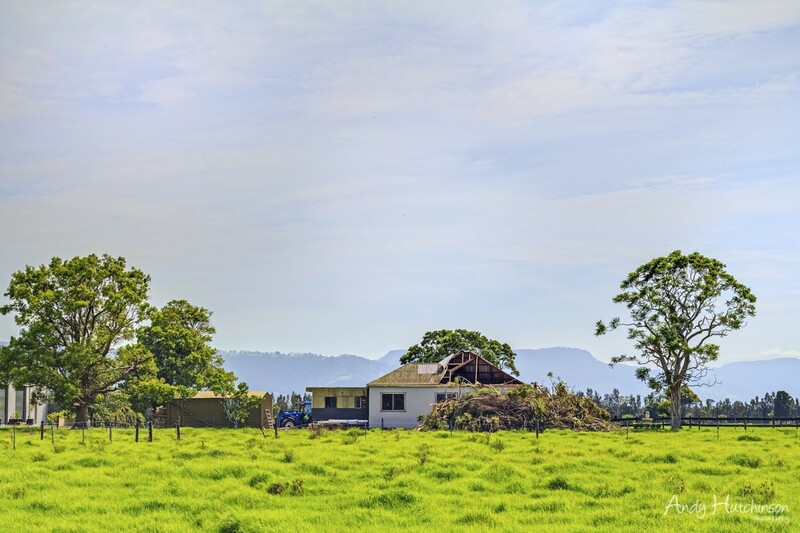 Backing onto the Shoalhaven River, this farmhouse was one of the first to get hit by the tornado on the southern side of the river. 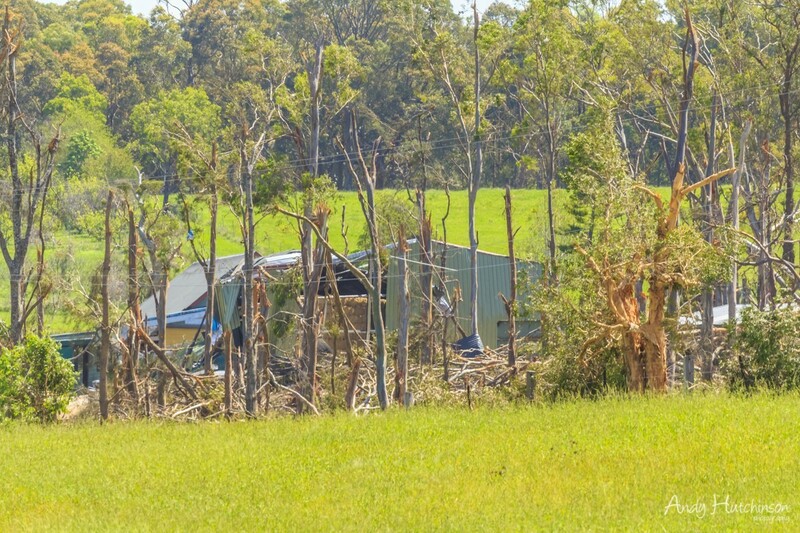 The roof was taken off completely, a tree fell on the farmhouse and the shed was badly damaged. Sign blown downThe tornado made its presence felt in the small riverside village of Terrara by first taking out the town sign, twisting it from its concrete footings. Many houses were damaged in Terrara, some lost roofs, some whole portions of the house. This home owner woke up to a scene of devestation in the front garden and the rear back of the house badly damaged by a falling tree. Further down the street in Terrara, the wind parted these trees, snapping them in two before destroying outbuildings and homes in the village. Homes and farms line this road in Terrara. Some were nearly wiped off the planet, some were totally untouched. The tornado’s power seems to have risen and fallen as it moved inland. 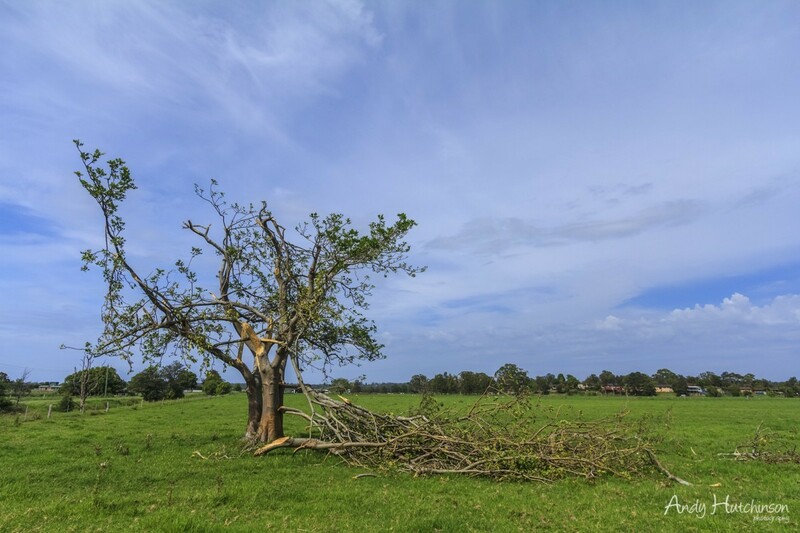 Many perfectly healthy trees were snapped like twigs by the winds. This tree managed to stay standing. Just. 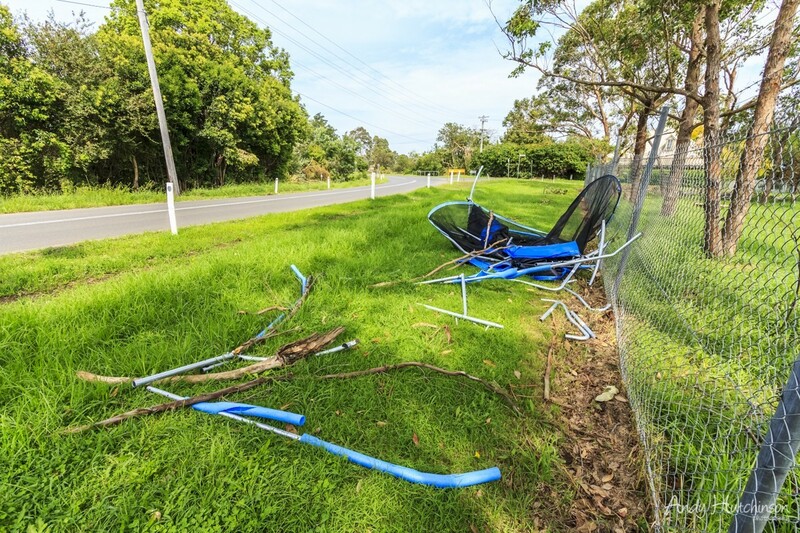 This trampoline was plucked out of a garden 500m away and dumped in pieces near the edge of the village. Fortunately the tornado struck at night, this road is very close to a large senior school. 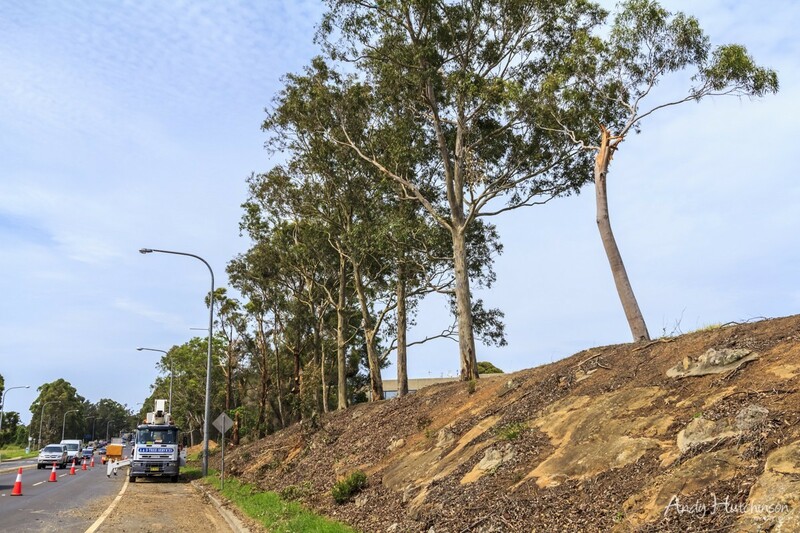 Now on the edge of Nowra, the tornado blew down or stripped bare trees in front of the council offices. 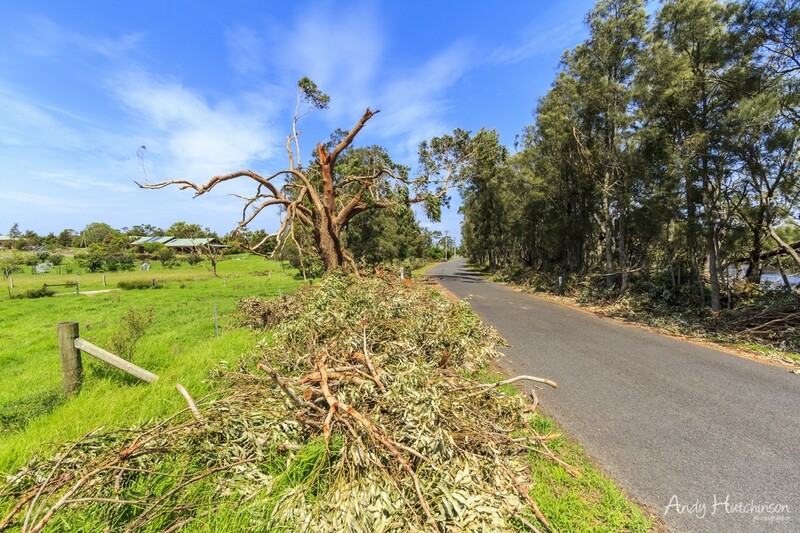 This is the Princes Highway – the main road passing through the region and one of the busiest stretches of road around. 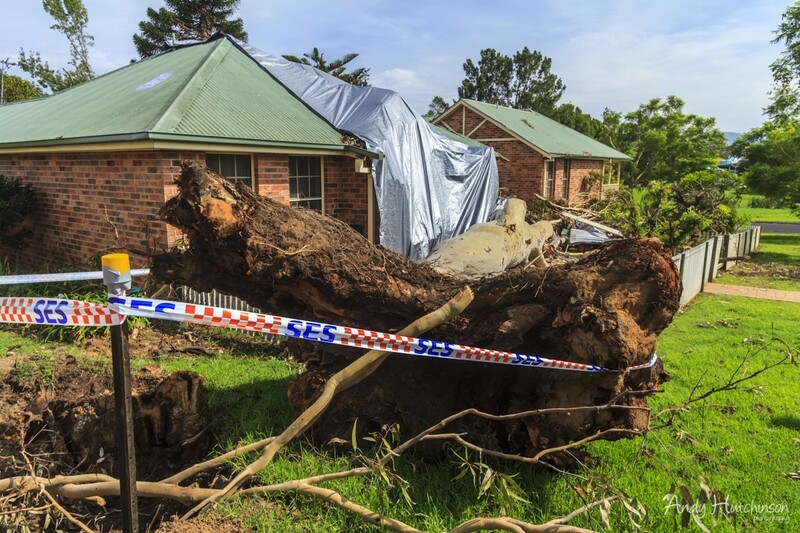 Now nearing the end of its destructive lifespan, the tornado wreaked havoc on these usually quiet streets in Nowra. Locals had petitioned to have this tree removed because they believed it was rotten. When it fell an infestation of white ants was revealed. 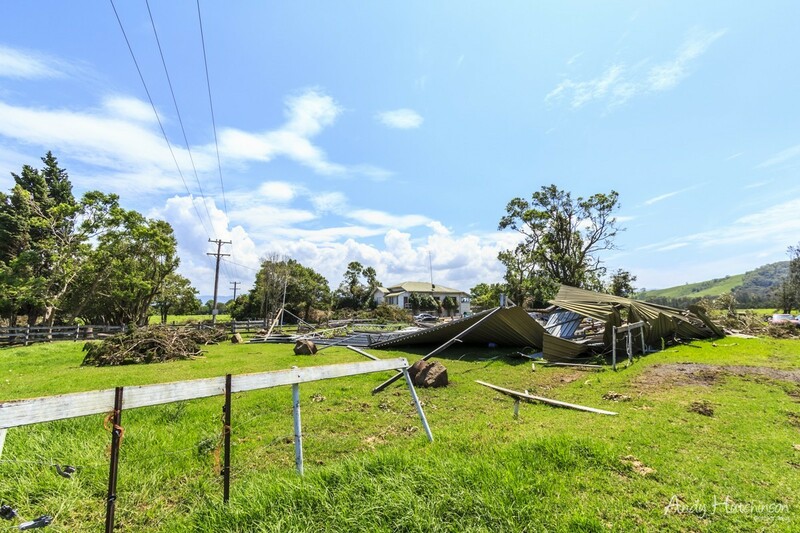 The wind then passed over the Shoalhaven hospital, damaging its roof, before fading out in bush-land to the west of Nowra. Australia is no stranger to extreme weather conditions. It copes with bushfire and flood far better than many countries do, but mother nature has always got a few tricks up her sleeve and nobody I spoke to could remember anything like this happening before. My thoughts go out to those people that lost their homes, livelihoods, livestock and pets to this tornado. Excellent photo’s also. Well done on the write up. Excellent commentary Andy, and your photos tell the story very well. Very scary stuff, to drive around and see the damage. We were very lucky. Quick question Andy. How far along the beach is the “Totem pole” that you have pictured. Access by SH Surf Club end or Beach Road? A friend mentioned the totem pole the other day, would like to wander up and have a look. I need to correct something here. I along with 4 other people were at Lords Ponies on the night this happened. She rents part of the house to my partner, and there are 2 other tenants here also. It’s true the owner was in Sydney with her partner, we rang her after it happened and they drove straight down here. The sheds and garage were destroyed, however the house itself suffered only a few broken windows. the fish on my property were from the ocean. the one I saw near the small dam on my property was mullet like. Black on top, red underneith with a silver stripe along the side. Thanks for the correction Karen. hanks for your comprehensive documentation of that terrible tornado. We live in Gerroa & it was scarey enough there. Thank God it happened at the time it did as I’m sure that there would have been great loss of human life had it occured during the daytime. This happen’s nearly every year in Nth Queensland and I am sorry it happens to you down there. We had four tornado’s hit our coast this year.